October is commonly recognized as the month packed with pumpkins, scarecrows, trick-or-treaters, and all things Halloween. At our dental office in Kettering, October has another important meaning that’s near and dear to our hearts; it’s National Dental Hygiene month – when we recognize our dedicated dental hygienists and bring awareness to the importance of proper oral health. We’re all taught from an early age to brush our teeth before heading off to school in the morning and prior to hopping into bed at night. This lesson should follow us throughout our entire lives. But it’s not only important to brush every day, it’s crucial that you brush correctly every day. To make sure you’re getting the most out of your routine, always brush twice a day for two minutes each time and use gentle circles with your soft-bristled toothbrush. Brushing is only half of a healthy at home oral hygiene routine. You should absolutely floss in between each tooth every day. If you don’t, you leave about 35% of each tooth’s surface uncleaned and exposed to the dangers of decay. Besides brushing and flossing, using a mouthwash that’s approved by the American Dental Association (ADA) can enhance your oral health. There are two types of mouthwash — cosmetic and therapeutic. Cosmetic mouthwash may temporarily mask bad breath but has no real oral health benefit, whereas therapeutic mouthwash with the ADA Seal of Acceptance has been tested to ensure it actually does what it claims, which is typically reducing bad breath, gingivitis, decay, and plaque. At our Kettering dental office, we would love it if every one of our patients would brush their teeth after eating. But we understand that’s not always possible. Instead, we encourage patients to keep sugarless gum handy and chew it after meals. Chewing gum helps produce saliva, which then helps neutralize and rinse away bacteria left over from lunch. Just make sure it doesn’t contain sugar and look again for the ADA Seal of Acceptance. These Daily 4 activities can go a long way in keeping your smile healthy. But even if you follow them exactly it’s still crucial to maintain your professional dental cleanings and bi-annual checkups. 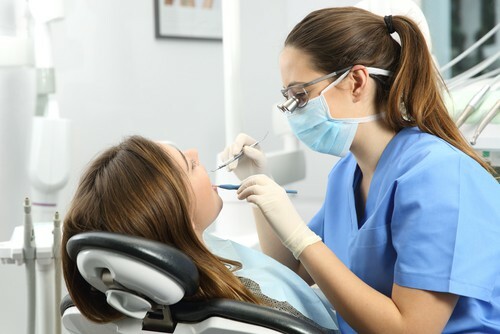 Regular dental visits help remove plaque and tartar and can help catch any potential problems early when treatment is still easy and more effective.